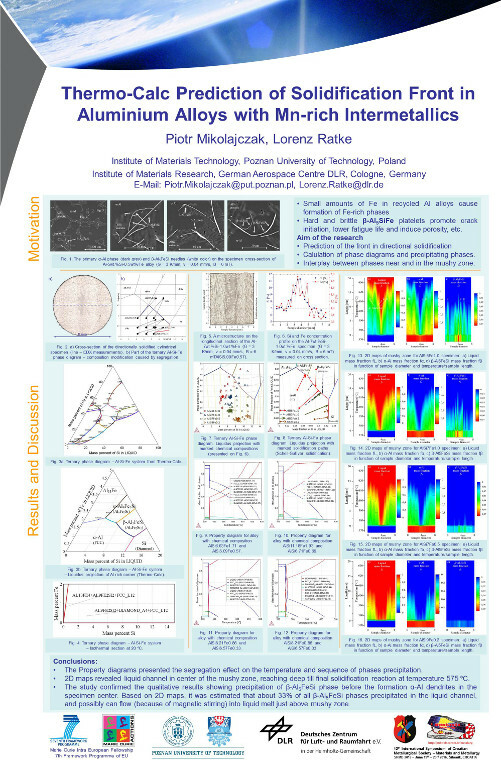 Piotr Mikolajczak, Amber Genau, Jerzy Janiszewski, Lorenz Ratke, Thermo-Calc Prediction of Mushy Zone in AlSiFeMn Alloys. ALUMINIUM 2016 – 11th World Trade Fairs & Conference. Organized by Messe Düsseldorf. November 29th – December 1st 2016, Düsseldorf, Germany. www.aluminium-messe.com. ThermoCalc prediction of solidification front in aluminum alloys with Mn-rich intermetallics. Solidification of AlSiMn alloys was studied using directional solidifi cation facility and the ThermoCalc software was applied to calculate phase diagrams and to predict occurring phases. The ternary phase diagrams presented different solidifi cation paths caused by segregation in each selected specimen. The property diagrams showed modifi cation in the sequence and precipitation temperature of the phases. It is proposed in the study application of thermodynamic calculations to visualize the mushy zone in directional solidification. 2D maps based on property diagrams show a mushy zone with a channel in the AlSi7Mn1.0 specimen center, where Mn-rich phases may precipitate separately to Į-Al dendrites. Morphology in slowly solidified AlSi9Fe0.3Mn0.3Mg0.3 alloy by various stirring speeds. 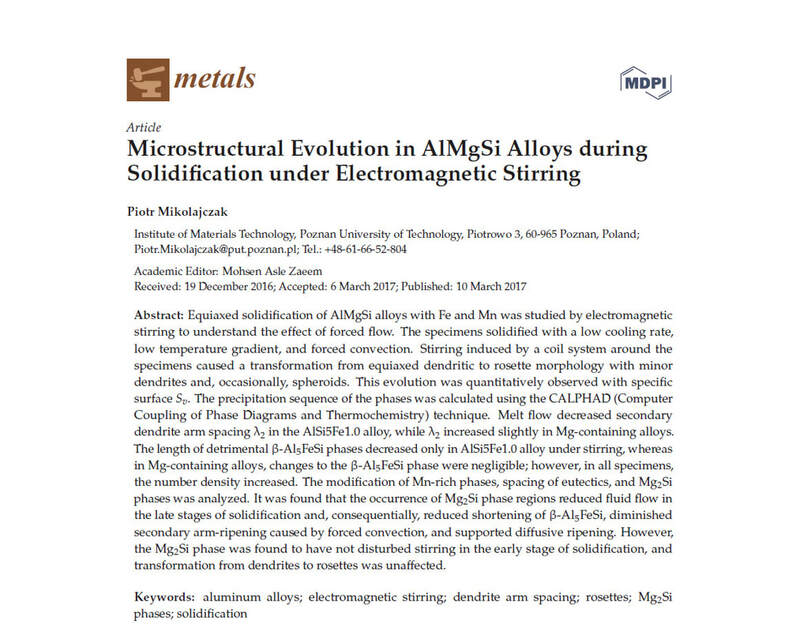 The paper present the effect of the intensive stirring on the microstructure of aluminum alloys AlSi9Fe0.3Mn0.3Mg0.3 slowly cooled in uniform volume solidifi cation. The stirring generated by rotating magnetic fi eld caused changes in precipitation of Į-Al dendrites and occurring phases. The measured chemical composition measured across specimens showed good mixing of the components. The modifi cation of the microstructure was studied as effects of the different rotation speeds and strength of the electromagnetic field. Effect of solidification velocity by forced convection on microstructure and Fe-rich intermetallics in AlSi alloys. 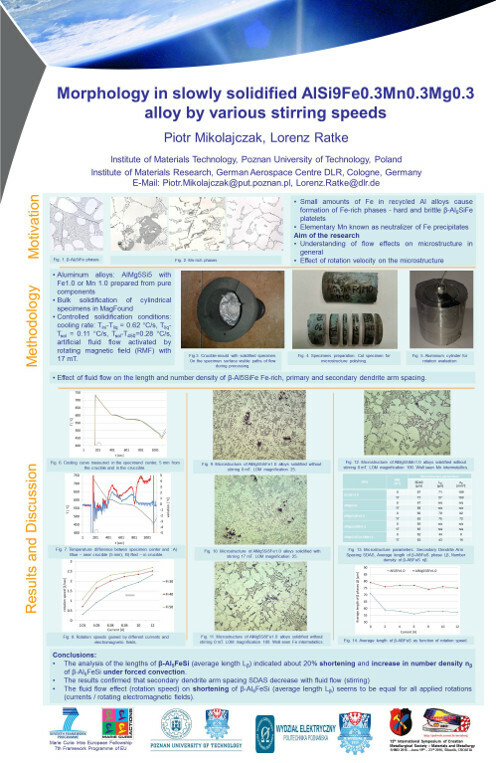 The current study aims to identify the role of forced convection on the alloys microstructure and formed intermetallics in Al-5 wt.% Si-0.2/0.4/1.0 wt.% Fe alloys directionally solidified under defi ner thermal and fl ow conditions in Artemis-3 facility. The experiments were carried out by various solidifi cation velocities from 0.02 to 0.12 mm/s. 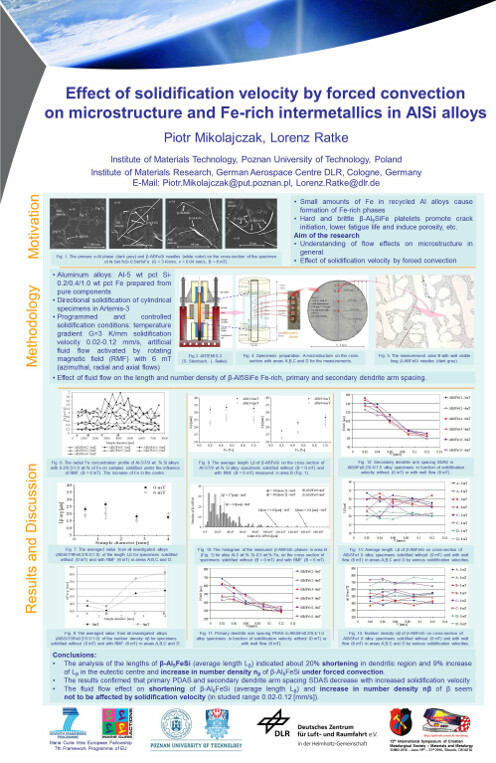 The results showed the effect of solidifi cation velocity by forced fl ow different on the length and number density of Fe-rich needles together with modifi cation in microstructure characterised by changes in primary and secondary dendrite arm spacing and specifi c surface of the dendrites. Project started at May 1st 2014.